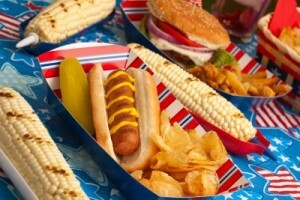 Are you throwing a fourth of July party this year? If so, celebrate the land of red, white, and blue by adding some green incentives to your holiday bash! Instead of using paper plates and plastic cups use ceramic dishes that can be washed and reused. Try cooking with gas and electric grills instead of charcoal ones, as they are better for the environment. Shop at the local farmers market and buy a wide array of fruits and vegetables for your guests. Finally, instead of having your own personal firework display for the party, carpool to a firework show in your area. Enjoy your next red, white, blue, and green weekend!